Given their sumptuous nature, it is no surprise that nearly every cuisine includes some variation on the comfortable, pillowy, stuffed-dough delights known as dumplings. 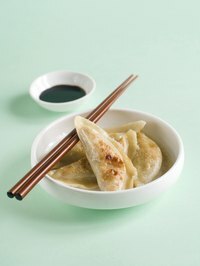 Chinese dumplings, often called potstickers, are the perfect blend of soft noodle dough and succulent fillings. Even better, they are widely available already prepared and frozen. While potstickers can be cooked in a variety of ways, they taste best when fried in oil and then steamed in a bit of water, which heats the filling to its piping hot best while leaving the wrapper both soft and crisp. Coat the bottom of a skillet with a bit of oil. Canola oil, vegetable oil and peanut oil all work well, though you can flavor a mild oil with sesame oil or use olive oil. Heat the oil over medium-high heat until it shimmers across the top. If you are using an aromatic oil, you should be able to smell it. Place the potstickers in the skillet with tongs, arranging them in a single layer so that they are not touching each other. Be careful where you place them because they should not be moved once they touch the bottom of the skillet. Brown the potstickers for 1 to 2 minutes without moving them. This helps them form a crisp, brown crust on the bottom that will stay delicately crunchy. Add slowly sufficient hot water to come one-third of the way up the sides of the dumplings and bring the water to a boil. Cover the pot, turn the heat down to medium and steam the potstickers for another 3 to 5 minutes, or until all of the water has boiled off. Check the internal temperature of the plumpest potsticker if yours were frozen without being previously cooked. The center of the dumpling should read at least 160 F for beef or pork, 165 F for poultry and 145 F for seafood. Slip the potstickers out of the skillet with a spatula or tongs, or loosen them and turn the whole skillet upside-down over a warmed platter. Serve immediately with an assortment of dipping sauces. Fill a large pot three-quarters full of water. Salt it generously to bring out the flavor of the potsticker dough. Bring the water to a full, rolling boil over high heat. Add the frozen potstickers one at a time, taking care not to splash yourself with the boiling water. Stir them gently to keep them from sticking together as they cook. Boil the potstickers for 3 to 5 minutes, or until the skin becomes translucent. Check the internal temperature of the plumpest potsticker if they were frozen uncooked. Move your broiler rack so that it is in the middle of the oven rather than the very top rack. Turn the broiler on to medium-high. Boil the frozen potstickers for 3 to 5 minutes in salted water, or until they float to the surface of the pot. This ensures that the filling is fully heated through. Drain the potstickers in a colander, gently shaking them to remove all the excess water. Arrange the boiled dumplings on a baking sheet in a single layer not touching each other. Oil the baking sheet or line it with parchment paper first if you like, to keep the potstickers from sticking. Broil the potstickers for 3 to 5 minutes or until the tops are golden brown and crispy. Check the internal temperature of the plumpest potsticker if they were frozen uncooked. Whisk a little bit of oil into your water when boiling potstickers to help keep them from sticking together as they cook. Do not move the potstickers if you are pan-frying them because this will make them stick to the bottom of the pan. Cooking Dumplings: Covered or Uncovered? Should You Cook Homemade Pierogies Before Freezing?